Penguins 'Fly' Through the Skies at Tokyo's Sunshine Aquarium! Penguins ‘Fly’ Through the Skies at Tokyo’s Sunshine Aquarium! Penguins can walk, they can swim, and they can slide on their bellies - but they can't fly. 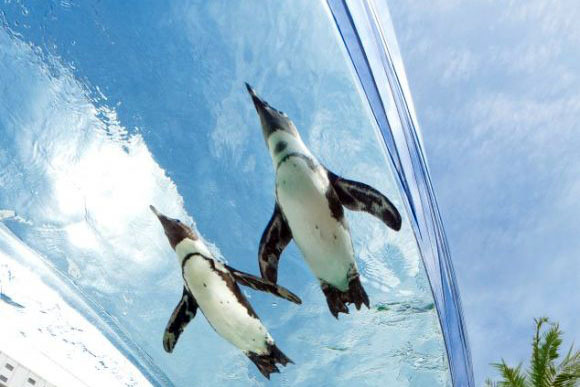 However, at Tokyo's Sunshine Aquarium, penguins are getting a taste of what flight might be like. The aquarium is currently hosting a special penguin exhibit that involves letting the penguins swim in the "Sunshine Aqua Ring" -- which is normally reserved for the sea lions -- for one hour each evening. So while they aren't exactly taking flight, it's still a unique way to view penguins that probably can't be replicated anywhere else in the world. The Sunshine Aquarium is a small aquarium located on the roof of a nine-story building in Tokyo’s Sunshine City. 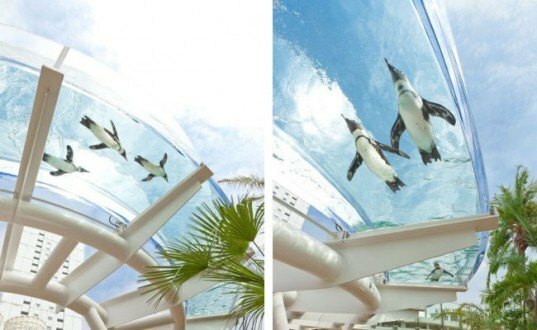 On the roof, the open-air “Aqua Ring” is elevated about 7.5 feet off the ground, giving visitors an opportunity to view sea lions — and now penguins — swimming from beneath. (This video shoes sea lions swimming laps in the Aqua Ring.) The “flying penguin” exhibit currently runs from 6:30 and 7:30 PM, and it is expected to run through September 2, 2012. The Sunshine Aquarium is the only place where you can see penguins fly (almost). Penguins appear to be enjoying their time in the Sunshine Aqua Ring. The Sunshine Aquarium is a small aquarium located on the roof of a nine-story building in Tokyo’s Sunshine City. On the roof, the open-air “aqua ring” is elevated about 7.5 feet off the ground, giving visitors an opportunity to view sea lions (and now penguins) swimming from beneath. For one hour each evening the sea lions are removed from the aqua ring to make way for the penguins. The “flying penguin” exhibit currently runs from 6:30 and 7:30 PM, and it is expected to run through September 2, 2012.